Recently named Self Advocate of the Year by Oregon Self Advocacy Coalition (OSAC), Kaaren Londahl is known throughout the community for the important work she does to advocate for the rights of individuals with a developmental disability in Oregon. Photo of Kaaren Londahl in northeast Portland. Within minutes of meeting with Kaaren, it’s clear why she’s been named Self-Advocate of the Year. Her experience and network are as robust as her enthusiasm for self-advocacy is infectious. Kaaren is an active board member at OSAC and Independence Northwest, and a member of the PHAME Arts Leader program. She also works at OCDD and PHAME. “I am a strong leader,” Kaaren states matter-of-factly, smiling as she hands me her OSAC business card and points out her title: Advocate at Large. What or who motivated you to become a self-advocate? Why is it important to be a self-advocate? “We don’t want programs to go away,” she says, noting that funding for support services can change. Aware of this possibility, Kaaren emphasizes that, "people need to speak with their legislators," to advocate for the services and programs that assist them in living a full life in the community. When asked what topics she and other self advocates address with legislators, Kaaren shares that, "we attempt to educate legislators about issues that matter to us," including: housing, employment, relationships, and transportation. In her call for more self advocates to attend Legislative Sessions in Salem, Kaaren points out that some people who would like to attend these sessions are unable to because of limited access to transportation. “If anyone from [Community] Pathways wants to drive people to Salem, that would be great,” Kaaren says, using her network to attempt connecting people with the support they need to achieve their goals. As Advocate at Large, what are your main responsibilities? 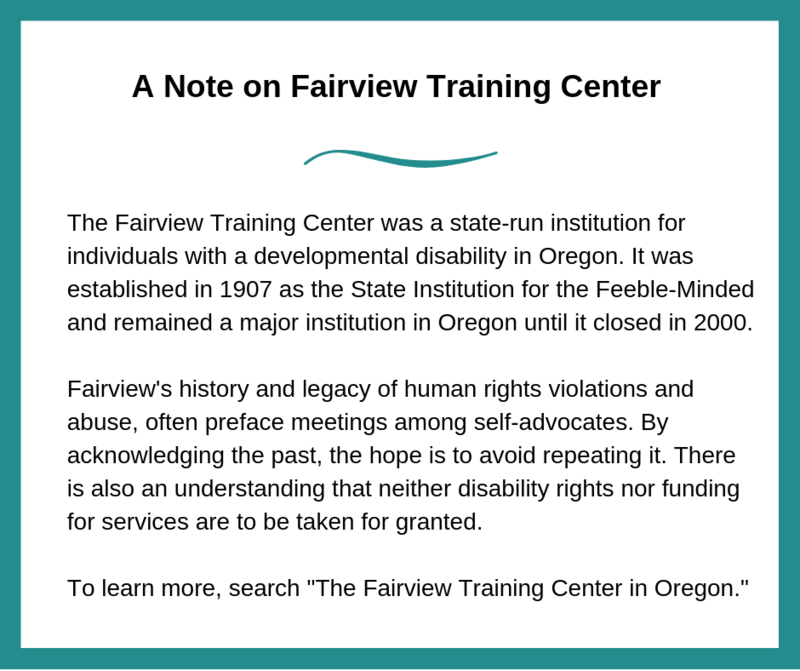 Kaaren shares that she recently joined the Oregon Council on Developmental Disabilities (OCDD) on a trip to Pendleton, Oregon where they met with individuals to learn about their experiences with support services. Their trip, she explains, is a part of a statewide effort to learn about support services from the perspective of individuals with a developmental disability in Oregon. What have you learned from individuals about their support services? She explains that when asked about their experience with support services, individuals expressed that they do not always know what questions to ask in order to receive the support they are seeking. With this observation, Kaaren pinpoints a frustration many people, regardless of their abilities, face when seeking help: Not knowing who to ask for help, or what questions to ask, in the first place. Kaaren says that more clarification about what to expect from support services would be helpful to individuals and their family members. What other obstacles do individuals receiving support services face? When asked what advice she has for parents and family members of individuals with a developmental disability, Kaaren says: “Let your kids do what they want to do.” She pauses before adding, “In a safe way. 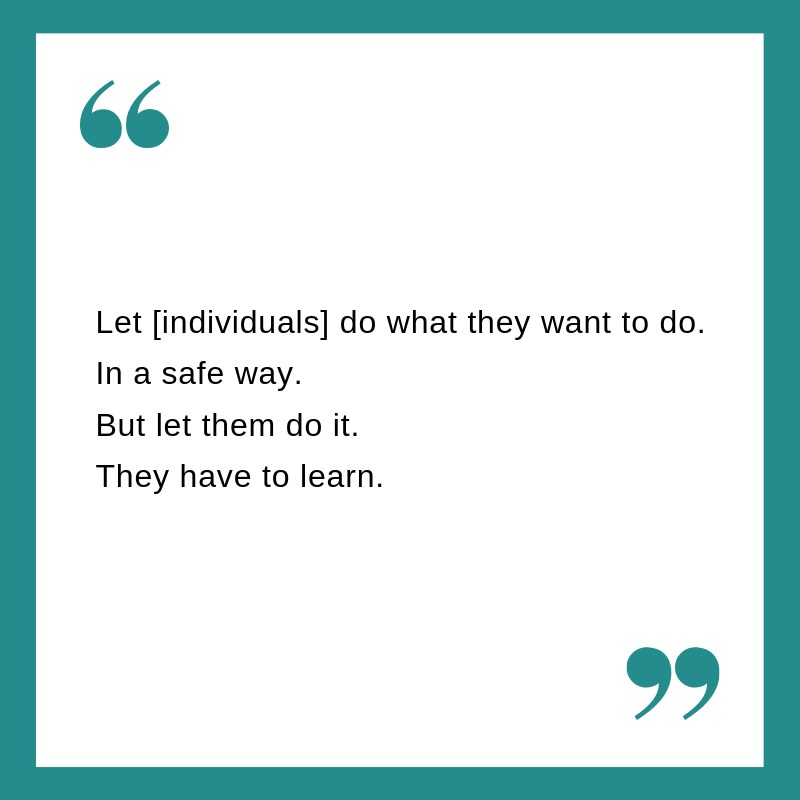 But let them do it.They have to learn." From meeting with individuals across the state, Kaaren notices that the number of individuals who attend these meetings is quite small. Asked why this might be, Kaaren says that individuals do not show up to events because they either do not know about them, their providers do not take them, or they lack accessible transportation. What would you suggest be done to address these concerns and help improve services? Host Brokerage 101 events to educate people about brokerage support services, so they learn what questions to ask. Educate providers about support services, as well as self advocacy groups and events. Promote programs like RideWise, which trains individuals to ride public transportation. How would you describe the support services you get through Community Pathways? “I like my services. They're great. They help me. They really help me,” Kaaren says. "You have to navigate things," she continues. "They help me grow. They help me learn about what's out there in the world." When asked what she values the most about her support services, Kaaren says it's the communication she has with her PA. “It’s nice having another person to talk to,” she shares. Photo of Kaaren Londahl standing next to an orange biketown bicycle in northeast Portland. How would someone interested in self-advocacy learn more about it? "They should contact me,” Kaaren says with a smile, pointing to her business card. What would you say to individuals who want to get involved in self-advocacy, but are shy or anxious about attending meetings and events? “They should contact me,” Kaaren says, pointing to her business card again. “Joining a group gives people a chance to get to know more people who have self-advocacy experience," she adds. "We will cheer lead them on to use their own voice." Of course, some individuals may still find it difficult to attend self-advocacy meetings for different reasons. When asked if individuals can attend meetings and events with the support of a family member, friend, or provider Kaaren says, "Yes, that's fine," but stresses that, "self-advocates need to speak up for themselves. The provider or parent should not speak up for them. We need to speak up." What is your advice for self-advocates preparing to speak with legislators? Stick to one question or topic per speaker. Only speak for a few minutes. "If you speak for too long, people will stop listening." Meet with your team afterwards to discuss what went well and what did not go well, and make the necessary changes to improve. Recently named Self-Advocate of the Year, what are you working on now? Kaaren lives independently in Northeast Portland with her dog. Her sister Dolly and nieces are an important source of support in her life and motivate her to advocate for her own rights and the rights of all people who experience a disability. Congratulations on being named Self-Advocate of the Year, Kaaren!